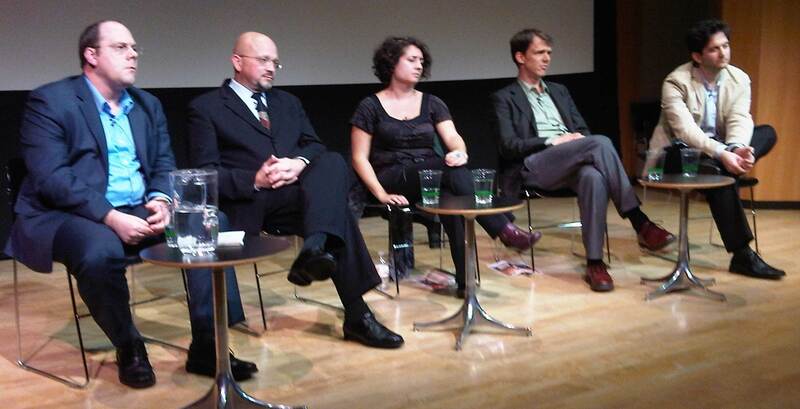 L to R: David Cote, Jeffrey Eric Jenkins, Claudia La Rocco, Rob Weinert-Kendt, Jason Zinoman. image: Martha Steketee. I believe in theatre and I believe in logical thinking and I believe in deeply-felt writing (and this doesn’t haven’t to be “emotional”) and I believe that all can combine to contribute to the written history of theatre. Yes, I believe that the profession that analyzes and discusses and engages with live performance is crafting history and is working hand-in-hand building theatre appreciative audiences and communities. Perhaps this is a matter of belief. Yet I contend this is also a matter of craft, as do the five people who parsed the future of theatre criticism on the stage of the Segal Theatre at the CUNY Graduate Center on October 25th. Resume credits for all panel members can be found at the link provided at the head of this blog post. In the briefest summary, the panelists and their current positions: David Cote (Time Out New York), Jeffrey Eric Jenkins (Best Plays Yearbook, NYU), Claudia La Rocco (The New York Times, WNYC), Rob Weinert-Kendt (American Theatre, StageGrade), and Jason Zinoman (The New York Times). Believers in theatre and in the role of the critic, with some nuances presented in engaged conversation for 90 minutes or so. The balance of this post will relay their own thoughts, roughly organized by questions asked by moderator David Cote or members of the audience. Q: How do you navigate the balance between journalism and criticism? Cotes wondered whether he, as a sometimes instructor of arts criticism, was encouraging “sophists, dandies, and dilettantes” while he was training writers to “write clearly when in a mode that’s not academic, more journalistic”. Jenkins responded that he teaches students at the theatre program at NYU who are already committed to careers in theatre — with dreams of being actors, designers as well as writers for the theatre. In his role editing the over 100-year-old Best Plays series of annual yearbooks, he sees daily criticism of current productions as “the first draft of theatre history” and the annual yearbooks, whether they provide the old format summaries and excerpts of 10 “best plays” or the newer play-focused essays, as “the second draft”. La Rocco noted that much of what is happening in theatre criticism today is genre crossing. She noted that she resists giving a grade or approving something. Critique to her is “cultivation of thought.” She considers the critic as sitting at the intersection of several spheres: the artistic creation, the critic’s own world view, and the larger culture. Cote noted that he has long imagined a fantasy graph indicating each known critic by his or her known biases and tastes — a kind of predictive tool to anticipate a critic’s reaction to a particular theatrical work. Q: What have we learned by aggregating reviews? Weinert-Kendt has created a review aggregator, StageGrade.com, that includes the text of the major reviewers and staff assign letter grades based on the text — an admittedly subjective process. He noted that he has found it striking that while there is not group think among the critics the site tracks, that the commentary “falls along axes of opinion” the more reviews a play receives. Q: Is it possible that theatre critics are less flexible than their colleagues in other fields? Jenkins — as an audience ember, you begin to know how your reaction, your critique, fits with the critics you follow. Weinert-Kendt — knowing a critic’s biases and creating assumptions about how they will react to any particular production is not a reliable guide for him. Zinoman — there is room for the “aesthetically ideological” in the field, such as Pauline Kael in film reviewing. Jenkins — sees himself as a bridge person between the old critics, the “first night critics” who were members of the Drama Critics’ Circle and knew where they stood. Q: New models are emerging for building communities such as a “performance club” that La Rocco hosted. Weinert-Kendt — there is a stronger on-line presence in other arts than there is in theatre. there has not been, in his view, the “promised internet takeover of theatre criticism.” The only difference between institution criticism to him is deadlines and whether people are paid. Zinoman — Economics matter. Bloggers need money so they move on to paying gigs. The number of people who are paid for reviews is down. Whether a writer receives health care has an effect on reviews — there is “dignity in the job”. Q: How do you balance the critical essay versus short form reviewing? Jenkins: the Best Play series, that has existed in some form for over 100 years, attempts to capture a full season on Broadway. [I also have 70 years of these volumes, courtesy of a theatre-loving grandfather, and through several editors during those years, the form morphed slightly to include introductory essays on the year on Broadway and off-Broadway and in several cities across America, and included a summary snapshot of each production — cast, number of performances, opening and closing dates, that kind of thing — for EACH Broadway show that season.] Jenkins described the current Best Play volume as summarizing the season on Broadway, and providing more detailed essay on each of 10 “best plays” (selected by a committee of individuals in the theatre). The established style of many years of the series was to provide a brief summary of the play, then selections from the script (a kind of annotated version of the script), or script highlights, in an almost anonymous editorial voice. Jenkins is changing this coverage of each “best play” to be an individually authored 3000-word essay, in a distinct and recognizable voice about the selected play and its production and its cultural context, with pull quotes. Jenkins noted that playwrights didn’t appreciate the old style. With his new style, he in each essay for 1/3 production information, 1/3 play information, 1/3 social and cultural context. Cote: Facebook is a way to begin conversations, perhaps get into arguments, that can inform these discussions about theatre. Zinoman: there is room on the web for much more to be done in theatre writing. He now is a heavy user of Facebook, which he got into when he had a child and found he missed kibitzing with folks in the office. He discovered that Facebook can be promotional and begin conversations if the parties are respectful of other points of view. Q: In the current Broadway climate, producers can attempt to reduce the power of critics, making shows “critic proof”. Is this true and is this a change from prior eras? Jenkins: in Los Angeles recently there was an open letter printed in one of the major papers, signed by several major producing companies, asking for *more* theatre critics in the city. Q: What form can criticism take to break boundaries and engage audiences/readers differently? Jenkins: there is a long tradition in American theatre criticism of reviewing the crowd, the audience, in attendance. To champion good work. To keep one’s own counsel. To practice a form of reporting. To honestly react to the live performance in front of you. To engage with context where you can, yet be specific and in the moment always. This is the magic of criticism of the live arts. And all of this informs why I’m enthralled by the practice of it now, after my own training as an observer, researcher, writer, journalist, dramaturg. 2/8/2011 edit: Claudia La Rocco let me know that a quotation I attributed to her about critic as cultural arbiter read as the opposite of what she truly believes. I have edited out this quotation as attributed to her.